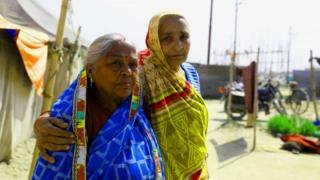 Manorama Mishra (72) and Girija Devi (68) are from two villages in northern India. Both lead lonely lives - Girija can go days without talking to anyone while Manorama's life is an endless wait for a visit from one of her children. Their lives take a happy turn, even if only for a month, when they arrive at the Kumbh Mela and find each other. 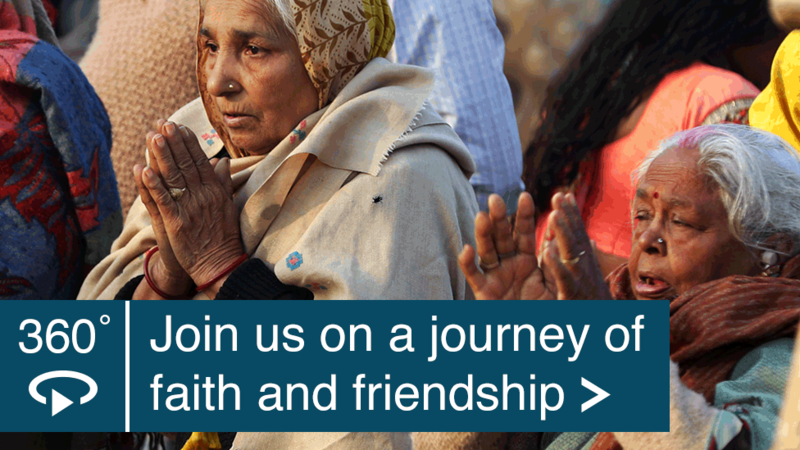 Follow their journey from loneliness in this BBC 360 film - or scroll down to read their story. On mobile - you will need to open the video in the latest version of the YouTube app for Android or iOS. The Kumbh Mela festival, billed as the world's largest gathering of people and held every 12 years, is known for its spectacular sights. 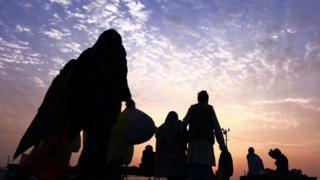 The mela (which means "fair" in Hindi) has been held in Allahabad city (recently renamed Prayagraj) at the confluence of the Ganges and Yamuna rivers in the northern state of Uttar Pradesh for centuries now. But in the past two decades, it has grown into a mega event, with this year's festival, which concluded in early March, billed as the largest ever - it's thought up to 150 million people may have visited between January and March. The organisers say there were even more. The kumbh is special to millions of Hindus because they believe bathing in the rivers will cleanse them of their sins and help them attain "moksha", setting them free from the cycle of birth and death. Sadhus - or ascetics - often draw most attention at the festival. For these elderly pilgrims, the festival has taken on a meaning that transcends even its spirituality. It has become a place where they can meet people of their age and form life-long friendships. Some even call it the place where they "find family". Manorama and Girija's friendship is one such story. They both arrived at the festival in late January, completely unaware that the other even existed. A month later, they were inseparable. 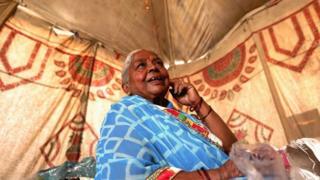 They say they met while Manorama was putting her things - a worn-out mattress, the idols of gods and some kitchen utensils - on the sand in her ramshackle tent. She had spotted Girija standing outside and looking on curiously. 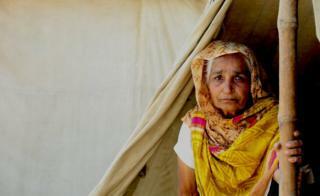 "You may want put some hay underneath your mattress because the sand gets really cold in the night," Girija said. "Thank you for the advice. Where are you from?" Manorama asked. But by that time, Girija had started walking away from the tent. 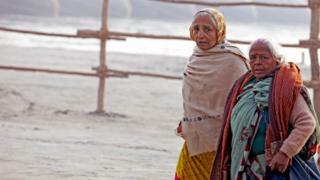 The next morning, they bumped into each other again while walking towards the Ganges to take a dip. Manorama asked her how she was doing - but instead of a response, just got a clueless look. The Kalpwasis eat only once a day and have to sleep on the floor - two of the many strict rules they have to follow to seek salvation. Girija was married at the age of 12 but two years later, her husband left her "because she was too short". Her father took her back in, pushing her to continue her studies. "I hate being alone. I don't blame my children, they have to earn. 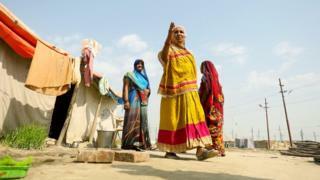 But urban migration is making many elderly people in India's villages lonely. It's a problem, but nothing can be done about it," Manorama said. They finished eating lunch. And just before leaving the tent, Manorama said to Girija: "But now you have me, even if it's just for month, you have a family." Image caption Manorama and Girija say that the festival is like the "happiest old-age home in the world"
Both of them had knee pain, meaning they couldn't walk for very long stretches at a time. So they would stop at shops or at the tents of other Kalpwasis on the way. "This is almost unbelievable for us. We don't get to meet so many people in our villages. 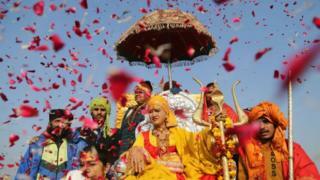 This festival is like the happiest old-age home in the world, and we cherish it so much," Girija told me. "We are not crying because we are scared of going back to our lives. I have tears in my eyes because I won't get see Manorama for a while. From this day, I will keep looking forward to coming to the Kumbh, or the Magh Mela which is held every year," Girija said. "I only wish that we had an old-age home near my village, so I can meet people. But I know that's a big ask. So I will spend my time waiting to meet Manorama and my other friends soon."